Very dangerous person. She's got "it". Her popularity is off the charts. She is the one Putin has been dreaming about all his life. 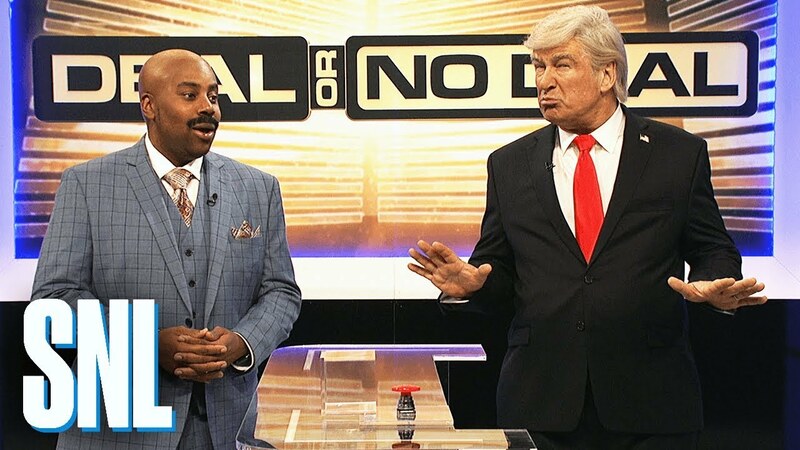 They merely flashed to an obscure actor portraying her on SNL and the crowd erupted in cheers like it was an Eddie Murphy cameo. She could destroy Trump if they could get around the 35 minimum age limit. Perhaps my meter is broken. She's beyond clueless. I can't imagine she'd get out of a primary, but if this country is stupid enough to elect her to a national post, then we deserve the hell that awaits us. By the way, if you DIDN'T think Michael Moore was stupid, and God help you if you didn't, this should erase all doubt. Last edited by WuDrWu; February 4th, 2019, 05:09 PM. Who is this AOC you speak of? If she is as good as is being advertised, I would vote for her in 2032...one year after the world ends due to climate change. I thought the world was supposed to end because of the tax cuts? I just watched Idiocracy again last night. I think we're going to get there well before 2505. No doubt with AOC GREEN NEW DEAL. Some Hollywood writer could really cash in by developing a prequel script for Idiocracy set in our current time frame going forward say 20 years. 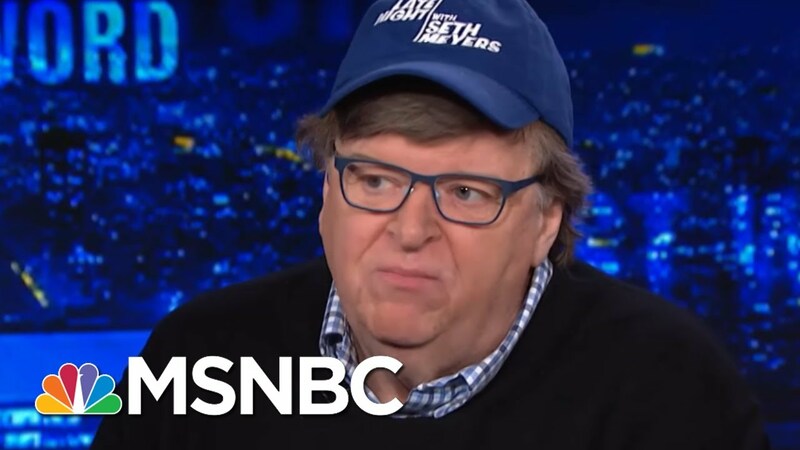 If I was Camera 2, I would walk over onto the set right up to Moore, flip his hat off, and ask him what he was trying to say. Wow, that is scary to listen to him talk. No wonder he likes AOC, he may be the only person that can look at her and think dang she is smart! He was seriously advocating to lower the age qualification for POTUS from 35 to 30 because back then people only lived to 38 or 40. What? Wouldn't that mean we should raise the age to around 70??? 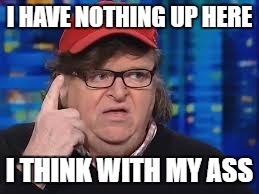 Michael Moore may be a Socialist piece of trash with Europe's nuts permanently hanging under his chin, but he's not stupid. He would vote for AOC in a heartbeat as would a legion of others. Remember how powerful the movement Bernie Sanders had orchestrated was becoming? So powerful that the Democrat party had to cheat to get their girl in. Had they allowed a legitimate election, Bernie would have smoked Shrill. Alexandria is a hotter, younger, more charismatic version of Bernie. Are you feeling me yet? She was bartending a year ago. I'm sure she will be even more polished by 2020-24. I have my bags packed and am planning on leaving the country if a Beto/Kamala disaster occurs. I have a little tropical destination picked out in Central America. My work is mobile so it will be no big deal. I won't pay any income taxes either! P.S. I'll come back and check on ya'll after the Civil War. I'll donate most of my high-powered rifles to the ShockerNet Militia. I'm probably just bringing a few pistols, an AR, an AK, and a shottie with me if I can get the necessary permits. I really wonder, if a poll were taken, how many Americans (on both sides of the aisle) would be for deporting this one... or rather just sending her back to kindergarten. You mean you get nervous about brainwashed children that come into power without having any understanding of what damage socialism has done to millions and millions of people all over the globe throughout recent history? You're right. These kids today think America is so rotten and evil that socialism would be a step up. They don't seem to love their own country, and anyone who does is most probably a bigot, in their eyes, even if said patriot -ahem- "doesn't know it,"
Just as telling is the obvious fact that they DESPISE the President of the United States. A lot of these people are legitimately deranged. They've assumed the position of moral superiority, thus gaining the right to demean and belittle, which actually contradicts a moral and ethical stance. Blame Fox News my a--. Last edited by ShockingButTrue; February 11th, 2019, 11:50 AM. Just a thought and I may be wrong, but AOC is the wave of the future. As the Baby Boomers slowly pass away in the next 10 to 15 years, the Gen X'ers will be the last bastion for the Republican party, Since women, Hispanics, African Americans, LBGTQ, Millennials and Gen Z'ers all tilt toward the Left, I simply don't see the Republican party remaining strong in the future. Conservatives are going to have to modify their politics to adapt to the snowflake generations the way I see it or else they'll go the way of the DoDo. I hope I'm wrong. I hope you're wrong too, but if that's how it goes, then there's going to quickly be a war as that clown show destroys the fabric of this country. They won't be in control long. They don’t have to drastically change the message, just the delivery. I have seen many presentations on how to communicate with Millenials. The left just does a better job of it than the right does. If you run or work higher up in a company and havent heard Jason Dorsey, you need to have him come speak to your leaders. Gen Z is actually pretty conservative, at least to my knowledge. I mean, I do go to high school with them. Less than 10% of the American populous holds the views of intersectional indentity politics. They are a vocal minority, but they will not gain substantial power. The socialists lefties are little more than moronic fearmongers. Look, we can't pay for all our programs TODAY. We run a trillion dollar deficit. If we took ALL the wealth from the richest 100 Americans, it's not half of one year's budget in this country. Let that sink in a bit. Roughly 2.5 trillion dollars. TAKE all their WEALTH. Everything they own, which is mostly paper, TAKE IT ALL. They have nothing left. It's 6-7 months of the government's bills. Now what do you do? You've got no new plans. You haven't changed the climate. The earth still rotates. You've killed all the babies you can. Everyone has weed. Now what do you do? It is mathematically impossible to tax the so called "rich" enough to pay for Medicare for all. Or education for all. WE CAN'T PAY TODAY'S BILLS! "I'm tired of hearing we can't afford internet for all. If Iceland can do it, why can't we?" Great point Amy. What did it take to get internet wired to the 10k rural Icelanders? Icelandiacs? Icecubes? A 6 month contract with Cox? Tell me how many illegals are flowing into Iceland living off the government teat? This is real world stuff folks. We play with live ammunition. These idiots and the people that cry with them are in for a very rude awakening if they don't change. It's not up to people like me to change. They have to change or we're all screwed.